In 2000, a group of American entrepreneurs moved to a former World War II anti-aircraft platform in the North Sea, seven miles off the British coast, and launched HavenCo, one of the strangest start-ups in Internet history. A former pirate radio broadcaster, Roy Bates, had occupied the platform in the 1960s, moved his family aboard, and declared it to be the sovereign Principality of Sealand. HavenCo's founders were opposed to governmental censorship and control of the Internet; by putting computer servers on Sealand, they planned to create a "data haven" for unpopular speech, safely beyond the reach of any other country. 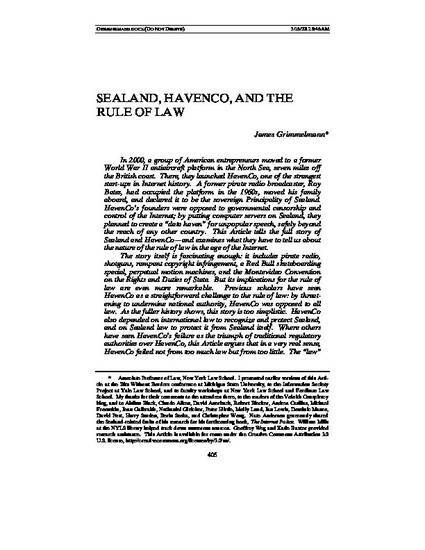 This article tells the full story of Sealand and HavenCo -- and examines what they have to tell us about the nature of the rule of law in the age of the Internet. The story itself is fascinating enough: it includes pirate radio, shotguns and .50-caliber machine guns, rampant copyright infringement, a Red Bull skateboarding special, perpetual motion machines, and the Montevideo Convention on the Rights and Duties of State. But its implications for the rule of law are even more remarkable. Previous scholars have seen HavenCo as a straightforward challenge to the rule of law: by threatening to undermine national authority, HavenCo was implacably opposed to all law. As the fuller history shows, however, this story is too simplistic. HavenCo also depended on international law to recognize and protect Sealand, and on Sealand law to protect it from Sealand itself. Where others have seen HavenCo's failure as the triumph of traditional regulatory authorities over HavenCo, the article argues that in a very real sense, HavenCo failed not from too much law but from too little. The "law' that was supposed to keep HavenCo safe was law only in a thin, formalistic sense, disconnected from the human institutions that make and enforce law. But without those institutions, law does not work, as HavenCo discovered.